Located along the Eastern Seaboard, Delaware is tremendously rich in natural resources and habitat. Although the second smallest state, it is rich in water resources ― 25 miles of ocean coastline, 841 square miles of bay, 2,509 miles of rivers and streams, and 2,934 acres of lakes and ponds. The water, natural resources, and ecosystems contained in Delaware’s watersheds are a valuable economic resource to the state. Researchers at the Institute for Public Administration’s Water Resources Agency (WRA) conclude that Delaware’s water supplies and natural resources constitute a substantial economic engine, which contributes somewhere between $2 billion and $6.7 billion to the regional economy in Delaware. Moreover, Delaware watersheds represent an economic engine responsible for more than 70,000 jobs and providing over $2 billion in wages. WRA project director Gerald Kauffman and associate policy scientist Martha Corrozi Narvaez led a team of IPA researchers ― associate policy scientist Andrew Homsey and assistant policy scientist Nicole Minni, who provided GIS mapping support, and research assistants Erin McVey, Catherine Cruz-Ortiz, and Chelsea Halley, who collected ecosystem services and jobs data in preparation of the writing of this important document. 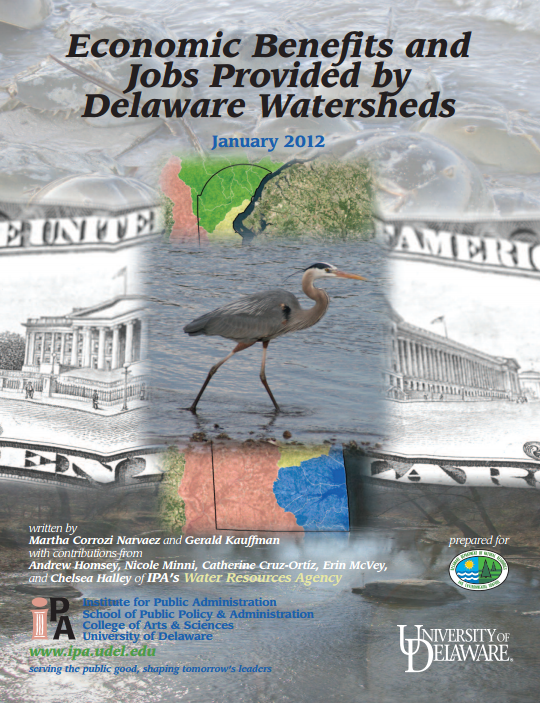 This report demonstrates that the natural resources of Delaware’s watersheds provide real and significant economic benefits to the state and are worthy of investment to keep them healthy and productive.